This pretty pink bracelet and earring gift set is a hand-crafted one of a kind...and if you like pink, this one's a must-have for you!! Each of the 7 pearl nuggets have been carefully hand-wrapped in sterling silver. 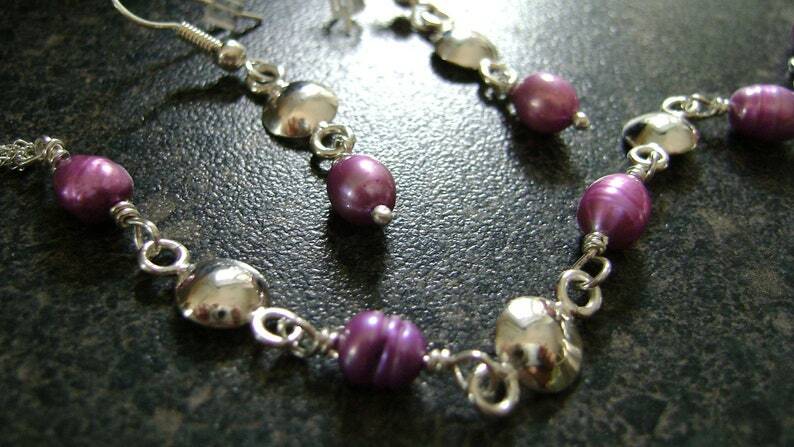 The pink pearls have a hint of fuschia / purple -- a wonderful, eye-catching color. The silver disc pattern is finished to a high-shine polish that catches and reflects the light (making these pictures very difficult to take!) Give your Valentine a one-of-a-kind gift that she will treasure! The 8.25" long bracelet is beautifully created by alternating 5 pearls (5mm) amongst the silver discs and is finished with 4 intertwined strings of 1.3mm curb chain, in keeping with the overall delicate design. This bracelet has a locking clasp closure. The earring focals measure 1" and are neatly paired with simple bead and coil shepherd's hooks. This set is shipped in a large kraft jewelry box with chocolate trim and is tagged sterling silver -- a perfect birthday, wedding, anniversary gift...or maybe a just-because for yourself! The pearl has always been the symbol of woman's perfect beauty. Precious pearl jewelry, much loved by kings, emperors, tsars, maharajahs, and princes can be admired in museums throughout the world. Produced by oysters, the pearl belongs to the marine animal kingdom. It is said that drinking pearl water regularly over a long period stabilizes the production of hormones. Chronic headaches and migraines can be alleviated or completely cured by wearing a pearl necklace directly on the skin. Pearls also reduce allergies. Psychologically, pearls promote wisdom and contentment into old age. Pearls should be worn on the skin and not be allowed to come into contact with make-up. If you are looking to add quality wholesale jewelry to your retail shop or gallery, OR need custom work, please contact me, I would be happy to discuss! !